Lauren is my crazy talented photographer friend and someone who really just inspires me. She is magic behind a lens and captures expression like no one else I know. She also happens to be a rockstar gift giver. For Father's Day, her very lucky hubby will be receiving this beautiful picture frame with a beautifully captured daddy-daughter moment with her sweet daughter "P". When she shared the photo with me, I just had to ask her to write a guest post so here it is! Hi thatssewnina readers! I am so honored to be guest posting here on the blog! It’s my first post on someone else’s blog, so bear with me. Nina saw a project I had done for my husband for Father’s Day and asked if I would do a guest post… and of course I said yes! It’s a quick project and super easy. I originally found the idea on pinterest. The original pin had no instructions, so hopefully my little tutorial will help you out. A shadowbox – I got a 8x10 from Hobby Lobby. All frames were 50% off this week, or you could use their coupons. Scrabble Tiles – I ordered mine from Ebay to get the exact letters I needed. You could sort through an old game OR check out the Hasbro website. They sell refill kits for $7.99 on their site. 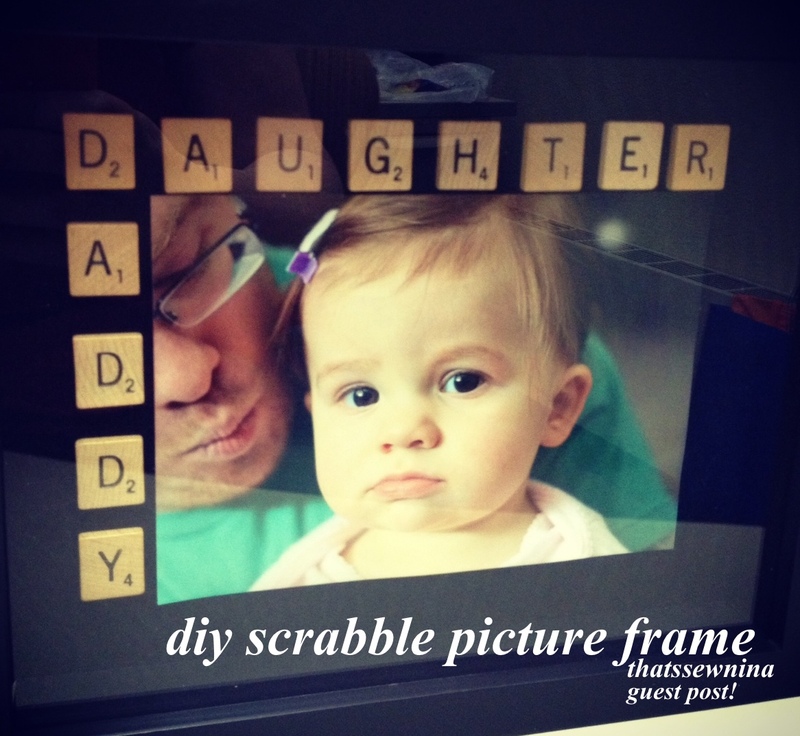 A pic of your little one – ‘Daddy’ and ‘Daughter’ worked out well for a 5x7 picture in an 8x10 shadowbox. Other words may fit better on a 4x6 photo if they’re shorter. All you have to do is disassemble the frame and adhere the photo and tiles directly to the mat. I used hot glue. You could also use superglue. Elmer’s or school glues may not work as well due to the velvety texture of the mat. Reassemble the frame and voila! Perfect gift! If your child has a name that starts with an M, D or G, that could also work well. IE Mommy & Margie, Grandma & Grant, etc, etc. Thanks for letting me share my project! Hope you all have a wonderful Father’s Day weekend!